Carlos Andrés Pérez Rodríguez (October 27, 1922 – December 25, 2010) was a president of Venezuela. He was born in 1922, served twice as president in the early 1990s, and died in 2010. Pérez was born on 27 October 1922 in Rubio, Venezuela. He went to school in Caracas, where he studied law. In 1948, he married Blanca Rodríguez, one of his cousins. During the same year, because he opposed a coup d'état, he was put in prison, but got out and left Venezuela. In 1958, Venezuala became a democracy, and Pérez became a part of the government led by Rómulo Betancourt. 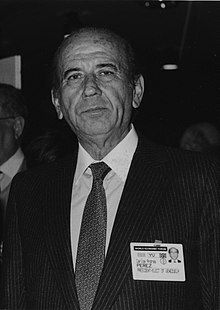 ↑ 1.0 1.1 1.2 1.3 1.4 "Carlos Andrés Pérez, Former President of Venezuela, Dies at 88". The New York Times. 26 December 2010. Retrieved 29 December 2010. This page was last changed on 24 November 2018, at 16:42.